Cybersecurity involves more than just your organization. Customers can be a security concern and need to be aware, informed, and engaged in cybersecurity content in order to help mitigate your organizations risk. How do you find, curate, and create content that properly informs your customers - without the cost and time commitment? 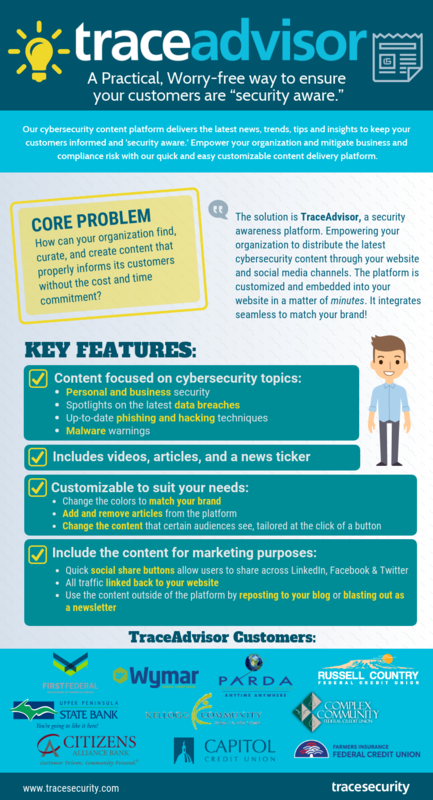 TraceAdvisor is our robust and flexible customer awareness platform that empowers you to distribute the latest cybersecurity content to employees, customers, or vendors through your website and social media channels. Set up is a breeze - the platform is easily embedded on any website with a single line of code in a matter of minutes. It can even be customized to fit seamlessly with your brand. The TraceAdvisor content, updated daily, is created and curated by cybersecurity experts, and covers a wide range of cybersecurity topics focused on everything from individuals to organizations. Find out more about how our platform can help your customers and employees be more aware of threats. Learn more about TraceAdvisor and how it can help keep you, your employees, and your customers aware of security risks. Customize your version of TraceAdvisor to solve your problem. Need a steady stream of cybersecurity information on your intranet for compliance purposes? Looking for content marketing that can be embedded on your website and customized to suit your brand colors? Want to use the content in your newsletter or blog posts? All of this is possible with our dynamic platform. Easily embed on your site with a single line of code. Spotlights on the latest data breaches, up-to-date phishing and hacking techniques, and malware warnings. Add or remove articles from the platform, or change the content that certain audiences see. Change the colors to match your brand. Includes videos, articles, and a news ticker. Quick social share buttons allow users to share across LinkedIn, Facebook, and Twitter. Content is updated daily to keep your customers informed. Includes content that is relevant for personal and business security. Our support team is here from 8-5 everyday, no extra charge for 'priority support'. How customizable is the application and content? Can I use the content on other portions of the website or post to my blog? How can the platform be used to help my content marketing strategy?